It has been interesting to watch the original "generalist" startup incubators and accelerator programs evolve into ones focused on various niche industry verticals. Which to me, makes a ton more sense. Here is a list of some of the industry focused startup accelerators and incubators that I have learned about. Penn Medicine Center for Healthcare Innovation (Philadelphia) - University backed by Penn. Media Camp (San Francisco/Los Angeles) - Corporate backed by Turner/Warner Bros.
Plug and Play Retail (San Jose) - Affiliated with Clorox, Hershey, Hilton, Home Depot, J&J, Kohls, P&G, Panasonic, Pizza Hut, Sears, and Simon Malls. 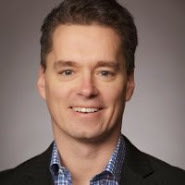 Techstars Retail (Minneapolis) - Corporate backed by Target. I am sure there may be many others that I missed. So, let me know if I have missed any important ones in the comments section below. Here are the links to download Red Rocket's free eBooks from your favorite eBookstores. Now it is easy to download our entire collection of startup lessons to your e-readers, if easier than reading these same lessons on our website. 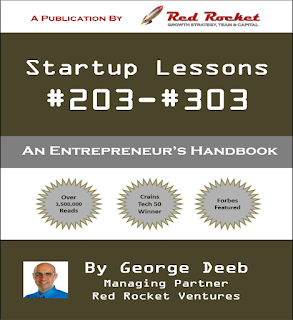 Red Rocket started writing its "101 Startup Lessons--An Entrepreneur's Handbook" back in March 2011. Over four years later, it has grown to over 202 startup lessons for entrepreneurs. It is a comprehensive, one-stop read for entrepreneurs who want actionable learnings about a wide range of startup and digital-related topics. The book is a startup executive's strategic "playbook", with "how-to" lessons about business in general, sales, marketing, technology, operations, human resources, finance, fund raising and more, including many case studies therein. We have demystified and synthesized the information an entrepreneur needs to strategize, fund, develop, launch and market their businesses. 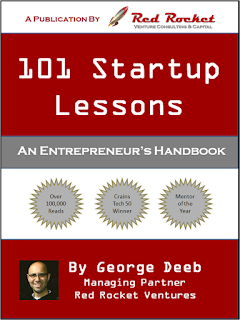 We published our first "101 Startup Lessons" in November 2013. 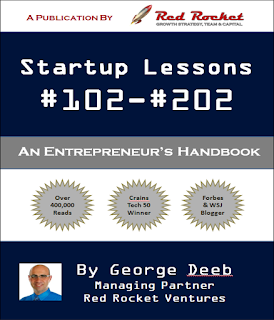 And, today, are excited to announce the publishing of our second book, "Startup Lessons #102-#202" in April 2015. Thanks to all of our 400,000+ readers who have already benefitted from these lessons via our blog, which we will continue to update with new lessons in the years to come. 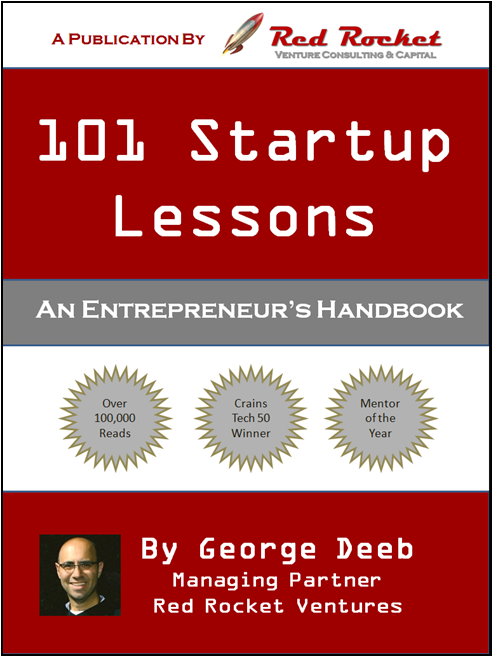 If you wish to download our first "101 Startup Lessons" eBook, you can find the links to your favorite eBookstore at this link. Thanks for sharing this editorial adventure with us. We appreciate your readership, and your sharing these lessons with your entrepreneurial colleagues in need. 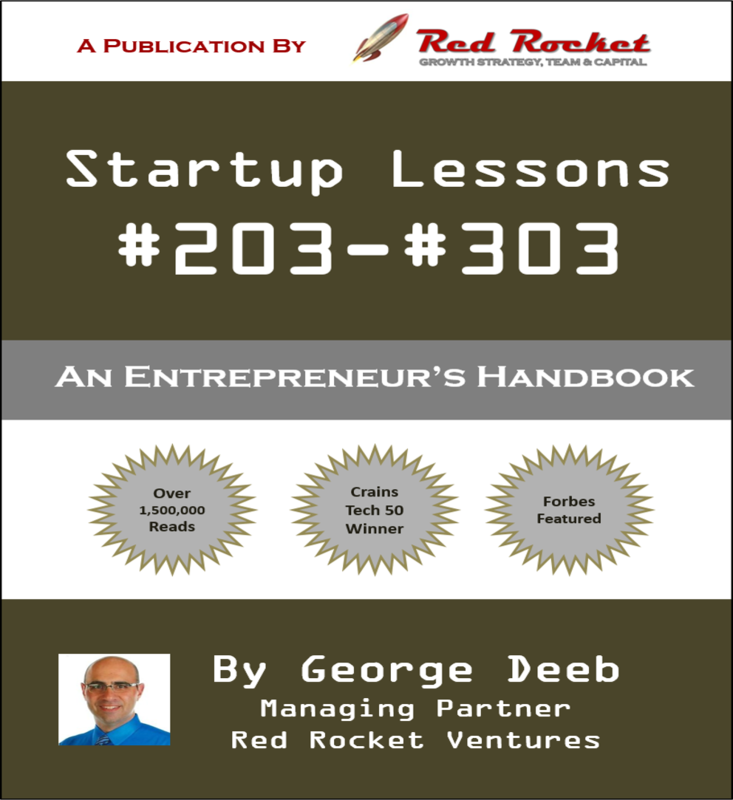 For future lessons, be sure to check back weekly on the Red Rocket Blog, or follow us on Twitter at: @RedRocketVC or @georgedeeb. 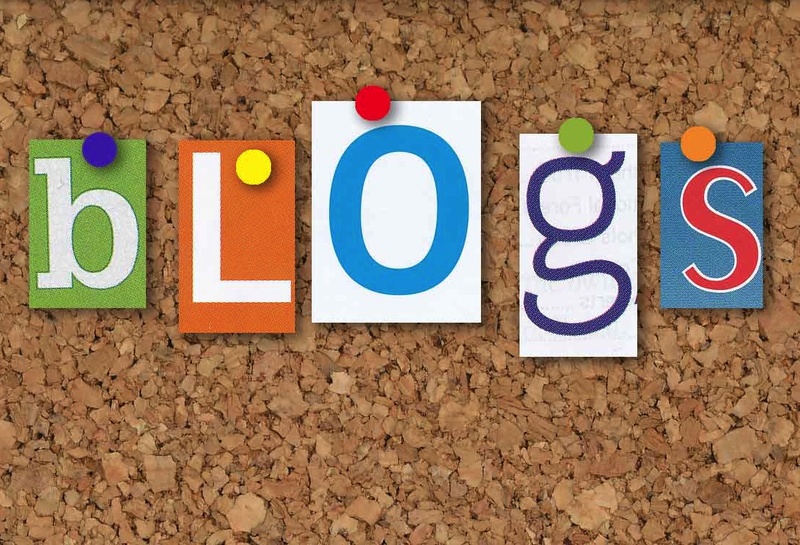 And be sure to check out the many others listed in the Top 100 Startup Blogs at Blog Rank and in the startup blog feeds at Alltop. And, the list goes on and on. But, this should be a good place to start. If you think I am missing any good ones, please add them in the comments section. Does Age Matter for Entrepreneurship? For years, people have tried to correlate an entrepreneur’s age when they launched their startup, with the ultimate success of that startup. Many studies have been done on the topic, including reports by the Kauffman Foundation, Duke University and the Founder Institute, to name a few. So, I am not going to try and rehash those studies. 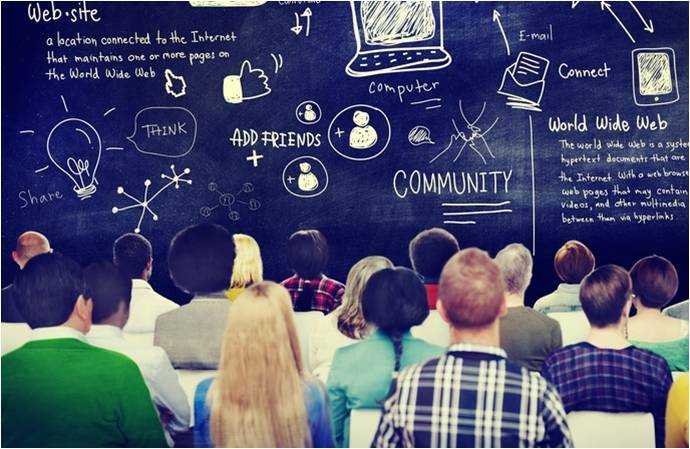 But, the collective summary of their learnings was the average entrepreneur is 40 years old when they launch their startup, and people over 55 are twice as likely as people under 35 to launch a high-growth startup. The average age of a successful startup with over $1MM in revenues was 39. It was determined age was less of a driver to entrepreneurial success than previous startup and industry experience. Read the rest of this post in The Next Web, which I guest authored this week. As a serial entrepreneur and growth consultant at Red Rocket, I have encountered hundreds of companies and some of the common pitfalls they run into related to sales. 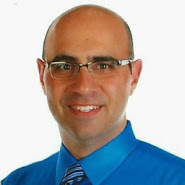 I've seen the impact those pitfalls have on effectively growing these businesses long term. Below are five pitfalls I see that commonly challenge entrepreneurs when they chase near-term revenues. These are pitfalls that often create long-term hurdles for these business down the road.